The depth of information embodied in the decorations of Taiwan’s traditional temples can sometimes seem intimidating – but that shouldn’t be a reason for anyone to miss out on the chance to enjoy their exquisite craftsmanship. The walls, roofs, eaves and ridges of temples are layered with meaningful decoration, not to mention the countless statues illustrating famous scenes from legend and literature. 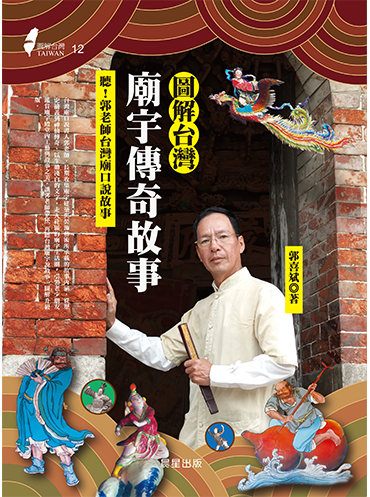 Kuo Hsi-Pin, an expert on temple culture, has written an engaging, unpretentious introduction to the most common of these stories, equipping readers with the knowledge to appreciate these traditional forms of art and architecture. This book divides these tales into ten categories, from the myth of Nüwa patching the sky to the most famous scenes in the Romance of the Three Kingdoms and Journey to the West; from the sea goddess Mazu to the enlightenment of Buddha. The stories are paired with attractive images, labelled to show the temple location, the names of the craftsmen, and the relevant historical era. The biographies of these craftsmen are also threaded through the chapters, opening up a whole new perspective on their art. In an era when traditional arts are in decline, Kuo Hsi-Pin’s labor of love offers a unique glimpse into a world of gods, demons, dragons, phoenixes and qilins, chronicling the masterpieces of craftsmen whose achievements are all too easily forgotten today.